Maybe I am the only one that does this… you are at a loss on how to organize something or don’t know where to start to clean/organize a particular area so you just DON’T. You don’t clean it, or organize it, and just try not to deal with it.. Anyone else been there? I think I am a little OCD – if things can’t be perfectly organized and cleaned, than I just want to shut the door and not deal with it. That is where I was with organizing digital photos over a year ago. I was overwhelmed with having hundreds/even thousands of personal family photos, scenery photos, and then with blogging having all kinds of photos that I took of projects/before+ after’s of rooms/yard sale finds, etc. And then edited and unedited copies of all of those too. I had been just keeping them saved on my SD card. And would just pull a copy off to put on facebook or on my blog – never saving them to my computer. Smart right? I mean, if I lost the SD card, hundreds of pictures would have been gone. Not to mention that before photos would be a hundred photos back, then some family event, then in process shots, then pictures of the cat, then finally I would take after pictures to blog the project and have to sift through all of those random photos on my SD card to find the ones I needed for that blog post. I finally decided to find a system that would work and I think I browsed Pinterest, google, and found some ideas. And I LOVE this system now and can’t imagine going back. First you need to find the location on your computer that is designated for photos. 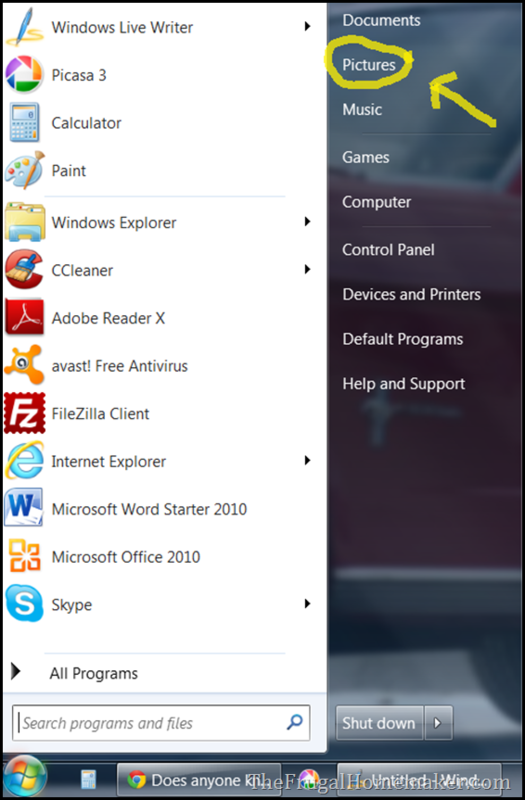 I have an HP laptop and am not running Windows 7 yet, so if you have an Apple computer or are running Windows 7 yours may look different than mine. 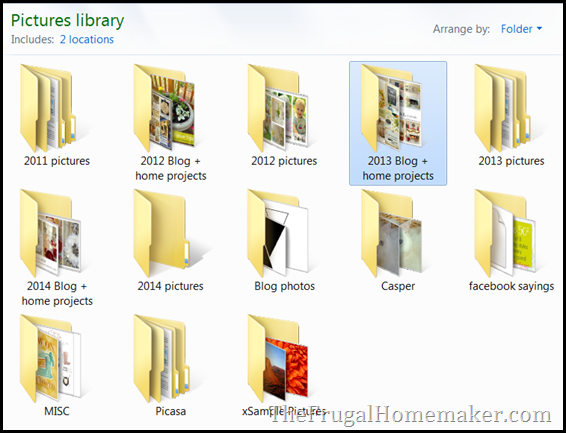 But you need your picture directory on your computer – I even make a shortcut to the picture folder on my desktop so I can even more easily find it. Click on that to open it and this is how mine looks. Yours may have random pictures in it – or however you have been saving pictures. I organize all my family/event pictures in folders by year, I have separate folder for each year of blog photos/projects, and I have a few other folders like one specifically for our cat that contains pictures from the last 5 years, a folder that I save inspirational sayings or pictures that I want to share with you on facebook, etc. 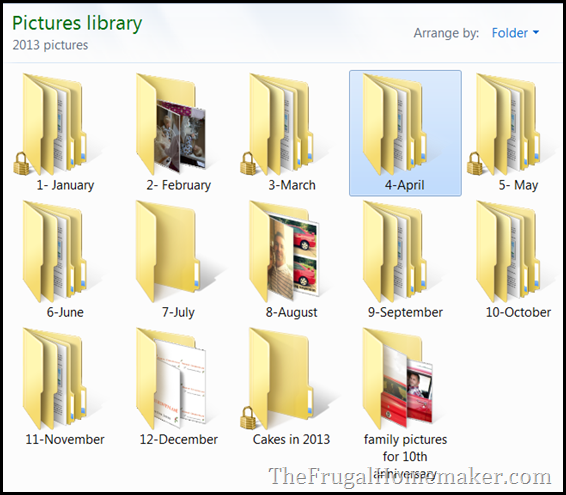 If I double click to open the 2013 folder, inside of that folder are more folders categorized by month. You can also see that I have 2 additional folders – 1 of cakes I did throughout the year so they aren’t scattered throughout all 12 months folder and 1 of our family pictures we had done for our 10th anniversary. If I double click on April, there are more sub-folders inside of that folder. Most of the time if you have a birthday party, a holiday, a trip, a sightseeing tour, or whatever, you are going to take multiple pictures of that one event. So you will probably want to put all the pictures from say “Susie’s birthday party” into 1 folder, then Easter is later that month so you would put all your pictures of Easter activities into another folder. Here’s what the inside of my “flowers” folder looks like. 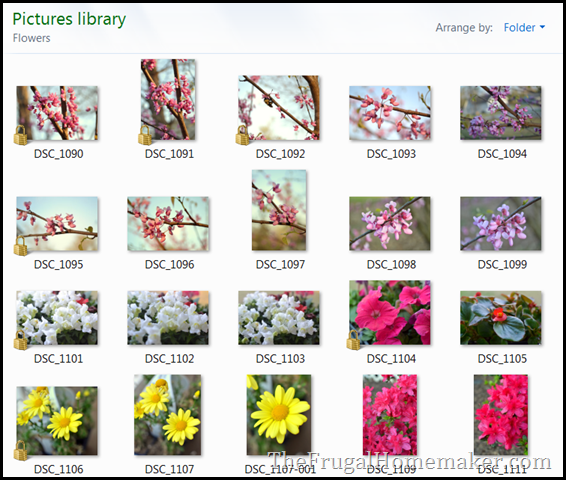 I took a bunch of pictures of spring trees and flowers – some to later use as art, some to enjoy or use on facebook… and they are all right here in this folder easy to find. I can edit them, and then save them right back to to this folder, and even change the file name of each picture too. Inside of that folder are many individual files of each blog post/project. So if I am working on a longer project such as a room re-do, as I take the pictures and pull them off my SD card, I can go ahead and be putting them in my “guest room re-do folder” and when the project is complete weeks later, all my photos are there from day one. This may be super simple to some of you and yet some of you may not be very computer savvvy… I happen to LOVE all things computer and enjoy learning more. I still keep the original copies of each photo on my SD card. It is my way of having a second backup of each picture. BUT along with having that copy, I need to be burning a cd of my entire picture folder or saving my hard drive to an external hard drive or using an offsite backup provider as well to back up all my pictures and work. Just in case you were wondering how I get the photos in those folders or even create the folders… here is how to do that. I inserted my SD card into my computer (or you could plug your camera into your computer) and usually a box will pop up that gives lots of options like import your pictures, view your photos, copy your photos, or open file to view photos. I select open file to view photos. And I also open my picture folder at the same time and have them side by side on my screen. To create a new folder, just click on “New folder”. You can click on the title and edit to name it whatever you want. I then select the photos I want from my SD card (highlighted in blue). To select multiple photos at once, hold down the “ctrl” key while clicking on the photos. OR if you want to select a group of continuous photos you can hold down the “ctrl” key, click on the first picture you want, then hold down the “shift” key too and click on the last picture in the series of pictures and it will select all the pictures of files from the first one to the last one. Then click and hold on any of the pictures that are highlighted and you can drag all the photos into your folder. I hope all of that is as clear as mud! If not… leave a comment and I will try to explain it better. 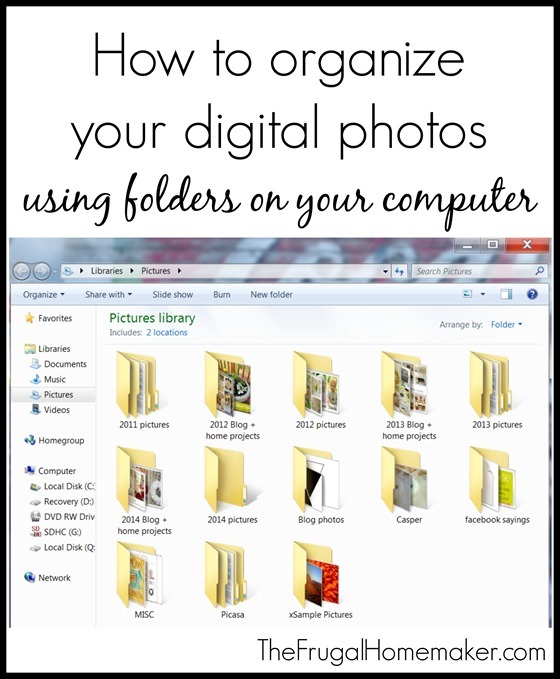 How do you organize your digital photos on your computer? Thank you for this! Some of us have had to learn all this tech stuff on our own, you know because back when we went to school there were no pc’s! Taking digital pics is wonderful, but the organization of them gets out of hand and I really needed this tutorial. 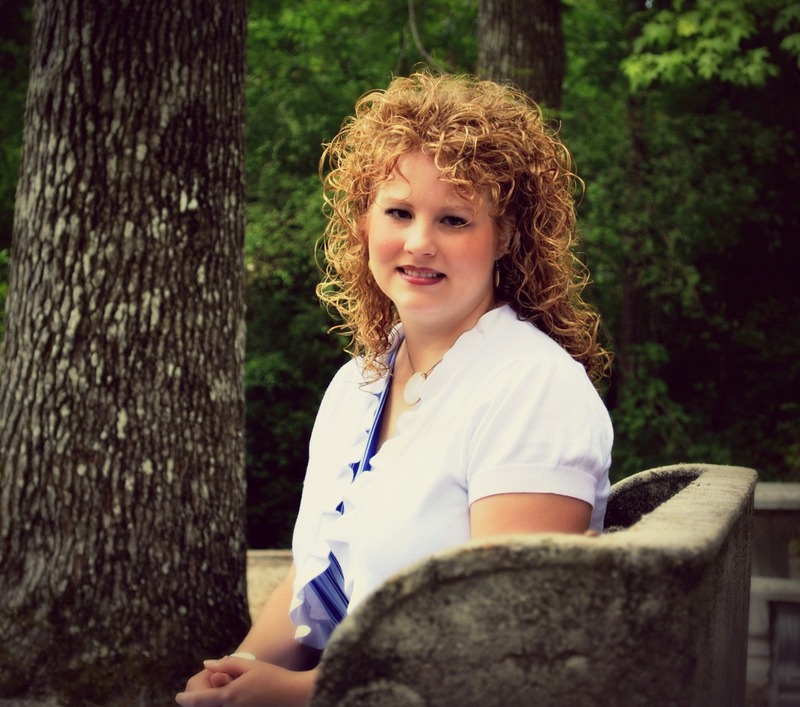 I have been struggling with what to do with all these blog/family pictures! Thank you so much for giving us insight on how you organize yours. So you don’t use an online storage site like Dropbox? 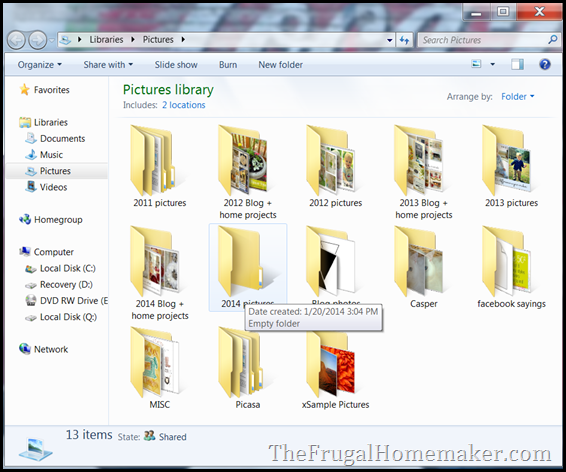 You use an external drive to store all your pictures? I need to use the best but least expensive option I can find. My goal was to start organizing photos by the end of January and I keep putting it off! This seems very doable. Great idea, thanks! This is a great tutorial! I’ve been organizing my photos this way for years. I use sub folders alot. I have copied older folders to thumbdrives which I label, and I also have an external hard drive called Click-Free that copies my entire computer contents to it. I do a backup once a month onto that to be sure ALL photos are saved! I really should store it somewhere out of my home! I have thought of putting all my little thumbdrives in a safe deposit box, as photos are so precious and if they were lost, I would be devastated. 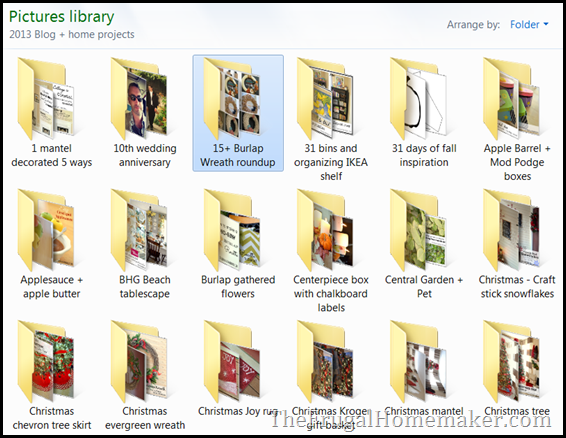 I have a folder for each Christmas and Thanksgiving, ie., Christmas 2001, Christmas 2002, etc., and then subfolders inside, such as Christmas Eve, Christmas Day, Getting Tree, etc. One thing I really like that I do is to put my most used photo folders at the top of my list. I wish I could show a picture of it here but…. normally I had Blog, Etsy, Scrapbooking, Digital Art. I was always having to search for them! Now they are all labeled AABlog, AAEtsy, AAScrapbooking, AADigital Art. That way, they are all at the top and easy to find! When I have to find my Trips folder or Furniture folder, I get tired of the searching! Also, I keep a folder entitled Furniture and have taken pictures of everything in our house (for ins. purposes). And that is also saved on a thumbdrive. 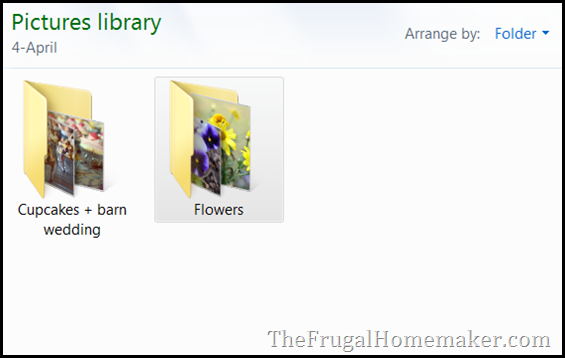 I did have flowers folders throughout my years and homes we’ve been at, but it was always hard to find the ones I wanted as couldn’t remember which year I took them. So I ended up copying ALL of my flower photos into one main folder, and underneath there are a few subfolders, but not many, as then I have to search them all! Sometimes simple is better. I find that if I sort alot of stuff by years, they are hard to find, so just having some main catagories is easier for me. My Etsy folder does have a sub category for each type of thing that I put in my shop, ie., paper flowers, tags, cards. 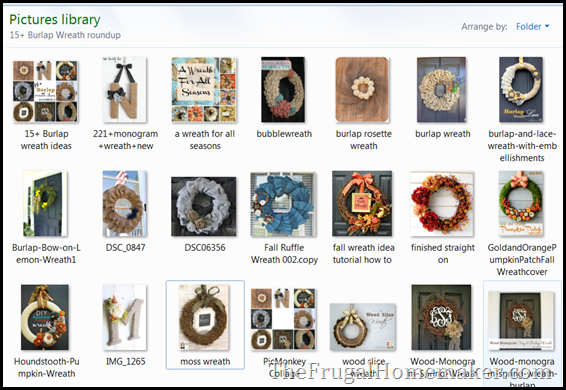 So I first take a photo and place it in the appropriate non Etsy folder, Then I copy the ones I want to use on Etsy over to my Etsy sub folder. Then I do my editing right there, keep the edited ones, and delete the ones I don’t want. Makes it easier to upload to Etsy that way. 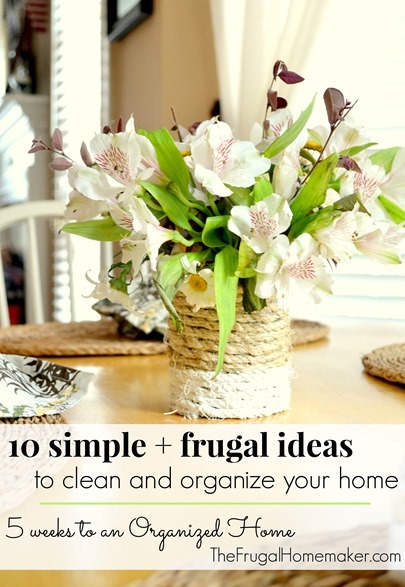 I’ve found a few good points on your post so will incorporate them into my storage methods! Thanks for the post! Marilyn McLeod recently posted..CROSS STITCH WISHES. I have always made “year” folders for my photos. I really don’t like putting other folders in folders, it makes it harder for me to quickly find what I’m looking for. I have always been an organizer…. Like you, if I can’t do it perfectly I don’t start. Perfection procrastinator. This site for organizing my photos on my computer was very helpful . Thank you for taking the time to explain. I know this is an old post. It showed up today on my Pinterest feed. Gettin’ some mileage for sure. I’m an ex-computer technician turned fulltime artist. And I’ve been agonizing over this same organization issue. Great tips and I’m taking your advice. But I’m adding a different spin. I have a bunch of free cloud storage accounts that I’ve never utilized. You know, the free ones you get for dropbox, google, msn, yahoo, icloud, blah blah blah. I worry about file backups like your other readers. So I’m treating these free cloud storage accts like top level folders. And then I’m setting them to back up each other. 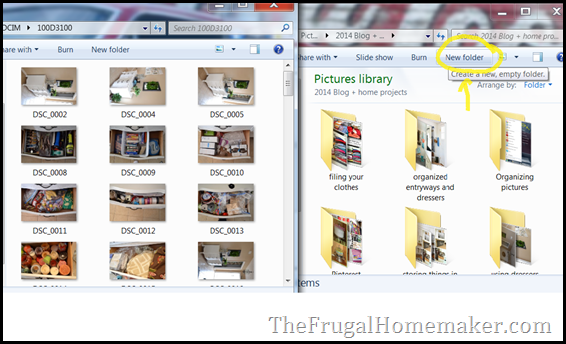 For example, my blog photos are on my G Drive which backs up nightly to my OneDrive. I keep reference photos for my drawing and painting on OneDrive. It backs up nightly to DropBox. If for some reason I lose one account, I still have a copy on another cloud. Plus, these are all accessible from any of my devices even while I travel. Thanks again for the inspiration! Thanks for the comment. I need to work on external backup. Currently just paying for Carbonite. But like you said… there are all kinds of free options out there. I would love to learn more details about how they are backing up to each other. If you have a post you write about it or articles you have read, feel free to pass it on. I always use dropbox, icoude, and then I have also all of my photos on Picasa web albums, and they are always safe there. I do not share them, but have them private. I have my pictures in Picasa, as well, but I have so many issues with Picasa itself. My pictures are constantly duplicating themselves and I struggle with organizing them. It always feels like the system is fighting me, so I am constantly creating a bigger mess. 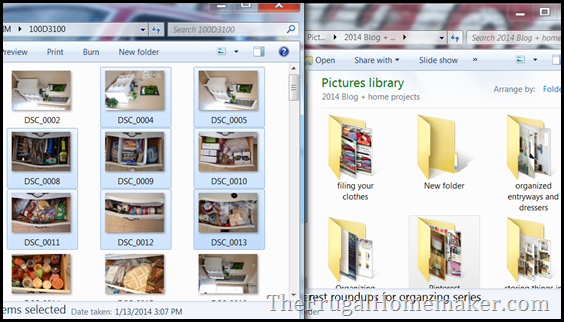 I have often wondered if there’s a better system than Picasa – one that still collects the pictures from everywhere on your hard drive, but does a better, simpler job of organizing them. Thank you for sharing. I need to get my photos organized again. This will be very helpful. I do this for a living in my organizing business. I’m currently organizing a client’s Expansion Drive where all the family photos are backed up. This is very similar to the basic structure I use. I then cater it to each client’s need.